This piece first appeared at ClickRally Magazine. While discussions of the budget deficit have been common in US politics for the last 20 years, the 2010 midterm elections and emergence of the Tea Party have drawn unprecedented attention to demands that the US government dramatically reducing spending and shrink the federal debt. Unusually, these calls for reducing government spending have reached the Pentagon – while military spending has historically been held sacred by Congressional Republicans, recently policymakers from both sides of American politics have called for reducing the US defense budget. These calls where given teeth in the debt ceiling deal in early August, which cut $1 trillion from the US defense budget. Possible future cuts, to be decided later this year, could raise these reductions by an additional $1.5 trillion. Some degree of defense cuts are coming – the sheer size of the deficit necessitates shrinking the federal budget, and the Pentagon is too big a piece of the federal pie to avoid the reach of government austerity. Some of the criticisms of reducing the US defense budget are valid: Secretary Panetta’s warning focused on the effects of across the board rather than targeted military cuts, which he insists will be more damaging to the overall capabilities of the US military than cutting individual missions. This argument is convincing, and should be heeded: rather than attempting to cut a certain percentage across the entire Pentagon, lawmakers should be willing to make difficult choices and recognize that inflicting cuts on the military necessitate asking it to do less. However, broader criticisms of any reductions in US military spending are less convincing. The core argument of defenders of US military budget is that some level of defense spending is necessary to provide the security that permits American freedom and economic prosperity. The core premise of this argument is credible – the benefits of defense spending extend beyond assets that are actually used in combat. However, even if defense assets are never actually used in warfare they provide a tangible benefit by deterring military aggression. While the United States faces close to zero risk of an open foreign invasion, high levels of American defense spending likely do deter attacks on US interests overseas. Finding the optimal level of deterrence is difficult. Ideally, the United States would spend the minimum amount necessary to deter potential rivals and no more. Of course, this type of simple cost calculation doesn’t work in the real world: optimizing deterrence spending requires balancing the costs of building a credible military deterrence and the monetary benefits of protecting US interests, two variables that are difficult to accurately estimate. Despite the difficulty of optimizing the costs and benefits of deterrence, the US military does play an important role in protecting US interests. Often, critics of American military spending will dismiss conventional forces’ contribution to the US deterrence force, arguing that the United States’ extensive nuclear weapons stockpiles are enough to deter any attack on the United States. Unfortunately, this is wishful thinking. While nuclear weapons are useful for deterring major attacks on the United States, their sheer destructive power doesn’t allow for variable responses to varied threats. Literally, because nuclear weapons are an all-or-nothing response, the threat to use them is not credible in most circumstances. The United States has experimented with reliance on nuclear weapons before: during the early years of the Cold War President Eisenhower, concerned about the affordability of the massive US military budget, drew down defense spending and planned to rely almost exclusively on nuclear weapons to deter a Soviet invasion of Western Europe. Unfortunately, this policy – termed ‘New Look” – was largely unsuccessful: while the US and European nuclear arsenals did deter as Soviet invasion, they were not enough to deter less dramatic threats to other US interests around the world. The Soviets knew that the US would not be prepared to initiate World War III for anything short of an open invasion of Europe, so the US nuclear force was unable to deter Soviet-inspired actions against peripheral US interests, like the invasion of South Korea. Successive US presidents abandoned the strategy of absolute reliance on nuclear deterrence. While the threat of the Soviet Union has vanished, this logic remains: the understandable American reluctance to destroy humanity means that nuclear weapons are not an effective military deterrence, and some level of conventional military spending remains necessary. However, US military spending far exceeds the level necessary to deter foreign aggression, even against peripheral US interests. Some of this excess is justified: if America wishes to fight long foreign wars and lead international humanitarian military interventions the Pentagon budget must support these missions. Despite this, American defense spending is ultimately vastly disproportionate to its core requirements. The US Navy is a good example of this excess. America currently fields eleven aircraft carriers. Russia possesses one, a Cold War relic vastly less capable than its American counterparts. Despite Chinese naval ambitions in the western Pacific, China has struggled to refit an abandoned Soviet carrier, the ex-Varyag, for combat, and the introduction of modern indigenous Chinese carriers is likely decades off. It is not unreasonable to suppose that America’s deterrence value would not be diminished if budget cuts forced the Navy to reduce the US carrier fleet. While a reduction in the number of US carrier battle groups would significantly reduce the number of theaters the US could exert military control over at any given time, this would likely not make US military threats less credible; that is, China would not be marginally more likely to invade Taiwan if the US fielded only seven six billion dollar supercarriers. Because the capabilities of all US military branches are so far beyond the minimum necessary to maintain an effective deterrence even if the US government dramatically reduced the defense budget America’s overall security and ability to project power on a global scale would remain far in excess of any potential rivals. Generally, the defense budget has historically been set based on the real requirements of external threats: in the post-war era it increased rapidly at the start of the Cold War, fell during the détente period of the US-Soviet relationship initiated by President Nixon, rose again during the 1980s, and fell slowly after the disintegration of the USSR. However, in the aftermath of the September 11th attacks real spending rose again, surpassing the Cold War high by the late 2000s. This increase is not reflected by the defense challenge facing the United States in the 21st century. Despite the horrendous costs of the September 11th attacks, it strains credibility to argue that defending against Islamic terrorism requires significantly higher defense expenditures than deterring Soviet expansion. During the Cold War, the United States faced a technologically advanced and militarily experienced adversary that credibly threatened to overwhelm Western Europe, and whose military assets – airplanes, tanks, and men – were often more numerous than NATO’s. While the threat of Islamic terrorism is real, the experience of the last decade demonstrate that it is not a threat that can be defeated or deterred by high levels of defense spending or conventional military forces. Of course, terrorism is not the only security threat the United States faces in the near future. China’s explosive growth as a world power and the expanding defense budgets of western Pacific countries all have the potential to pose serious threats to world stability and US security in the near future. Unlike terrorism these potential threats require expensive naval and air assets to counter. This is often seen as an argument for preserving, or even raising, the US defense budget. However, the emergence of near-peer future competitors is not a convincing rational for costly US military spending, simply because an overwhelming share of world military spending belongs to either the US or firm US allies. 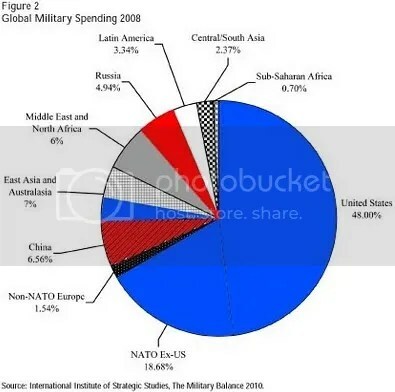 The individual segments of this figure – from 2010 Cato Institute paper “Budgetary Savings from Military Restraint” – have been flagged according towards their diplomatic status to the US: blue represents the US or firm allies while red is Russia and China, the only likely near-peer NATO competitors in the foreseeable future. The huge disparity between NATO spending and its only potentially serious rivals is obvious: NATO spends 67% of the total world defense budget, while Russia and China combined spend only 11.5%. Of course, the Chinese defense budget is increasing, and the Chinese economy has the ability to support a dramatic rise in military spending. However, the sheer size of the US fiscal lead above its rivals challenges the plausibility of arguing that any cuts to the Defense Department budget are dangerous. The US could halve its defense budget – a move few consider remotely plausible – and still outspend the rest of NATO combined. The enormous size of the US military spending lead over all potential rivals is a strong argument that reducing the Defense Department budget would not be dangerous. However, ideological opponents of reducing defense spending often attempt to obscure this lead by pointing out that US military spending is actually fairly low as a percentage of total GDP. This argument is technically true but misleading. This does not deter its proponents: Sarah Palin has endorsed this view, once incredulously asking supporters if they knew “the U.S. actually only ranks 25th worldwide on defense spending as a percentage of GDP?” At face value, this statistic is troubling: how can we be assured of America’s safety if our military spending is comparably so low? Of course, it isn’t that simple. It is true that at under 5% of GDP American defense spending ranks at 25th in the world. However, nearly all countries that rank above US military spending as a percent of their total economy are tiny, impoverished non-industrial nations: Oman, Eritrea, the Maldives… none of these high spenders are exactly military behemoths. Overall, nations that spend over 4% of GDP on defense are either those facing extraordinary security situations (Israel) or poor countries with misguided spending priorities. In fact, this trend continues for those ranked below the US in terms of spending as percent of GDP: the next highest fractional spending rich democracy is Australia, trailing at 43rd. Any way you look at the data the US spends an enormous amount of defense, both in absolute and fractional terms. However, it is true that the United States’ high level of military spending does buy it a significant capability advantage over other military powers, and reducing the defense budget would erode these capabilities. The Libyan war has dramatically illustrated the capability difference between the US military and its European NATO allies – despite European enthusiasm for establishing the no-fly zone over Libya, France and the UK have encountered significant logistical problems maintaining sustained combat operations overseas. It is also worth remembering that the Libyan no-fly zone is a fairly unambitious operation: flying air operations on the other side of the Mediterranean have strained the capabilities of European NATO leaders, despite their relatively robust defense budgets. This illustrates the dramatic difference between high levels of military spending and truly expeditionary military capabilities. Despite budgeting the world’s third and fourth highest military budgets, France and the UK do not possess the capability to fight in major conflicts overseas for extended periods, a capability unique to the US. Maintaining this capability – which requires investing in numerous naval, air, and logistical assets – is enormously expensive for the United States, and entirely out of reach of the rest of the world. Reducing US military spending would negatively impact the United States’ global expeditionary capabilities. For example, while replacing the US Navy’s current fleet of 10 Nimitz class supercarriers with only seven of the future Ford class would likely save over $20 billion (accurately pricing future carrier construction projects is difficult, due to the need to incorporate development costs across an uncertain number of individual ships. $20 billion is a rough estimate), it would also mean that Navy aircraft could be in three less crisis zones. Make no mistake: cutting the US defense budget would not be painless, and it would result in real losses of US capabilities. But increased capabilities do not equal increased American security on a one-to-one basis. As alluded to before, a reduced defense budget means a smaller carrier fleet, lower number of active-duty Army personnel, and fewer USAF combat aircraft. But it is unlikely that these capability losses significantly degrade the deterrence value of the US military, and its ability to defend core American interests. Similarly, cuts in the American defense budget will reduce America’s ability to decisively win future wars by reducing the US military’s marginal dominance over potential rivals. By slashing cutting-edge programs like the Air Force’s F-22 fighter aircraft or the Army’s Future Combat System vehicle program, critics of reducing military spending argue, the United States is losing its military lead over its rivals and imperiling its future military dominance. This is true. By choosing to widely adopt the less capable multi-role F-35 fighter aircraft over the more expensive F-22 the Pentagon is reducing its effectiveness in a future conventional air war. These limitations apply to other programs as well – by declining to fund advanced procurement programs the Pentagon is increasing the service lives of weapons systems that are already decades old. However, this argument should be taken with a grain of salt. It is important to remember just how dominant the US military really is. The US Navy uniquely can project power on a global scale, and the US Army retains the ability to quickly defeat any conventional opponent in open ground warfare. No nation remotely approaches the expeditionary capability of the United States: not European NATO allies, or potential rivals like Russia or China. The majority of the countries that even begin to approach the quality and abilities of the US military are firm democratic allies. America’s lead is even stronger among potential US adversaries: the defense spending of Syria, North Korea, Iran, Russia, and China combined is dwarfed by the Pentagon’s budget. China, the closest the Unites States has to a hostile comparable power, spends less than one sixth of the US’s actual military budget. 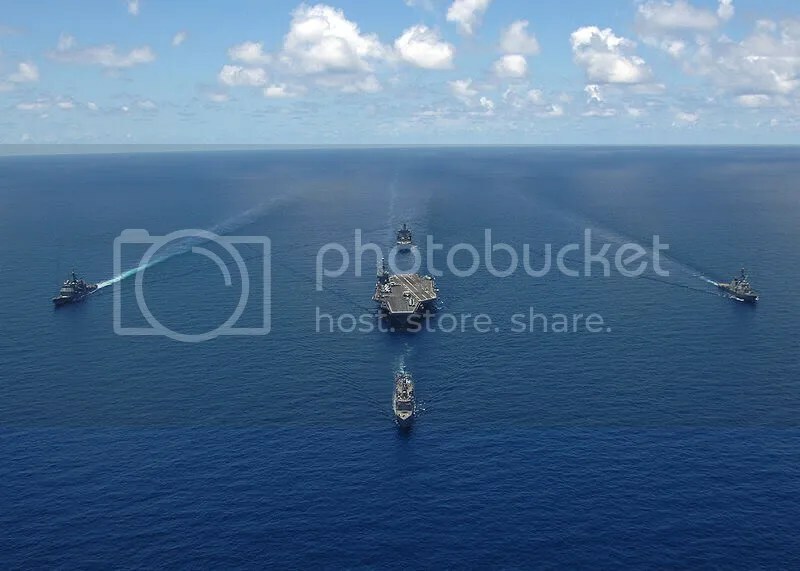 For the smaller nations much more antagonistic to the US the disparity is even greater; ultimately, even substantial cuts in US military spending would not endanger American dominance. Any realistic effort to reduce the US federal deficit must include defense cuts. US defense spending is one of the largest individual components of the US federal budget – in 2010, the Department of Defense spent $689 billion, or roughly 20% of the federal budget, a percentage surpassed only by Social Security and medical entitlements.The federal budget is limited, and every dollar spent on defense is a dollar that can’t be spent somewhere else. Secretary Panetta is aware of the conflict between social and military spending, remarking in an interview with reporters August 4th that government budget cuts should come from non-discretionary entitlement programs like Social Security and Medicare, not the Pentagon. On its surface, Secretary Panetta’s argument appears convincing. The United States currently spends twice the OECD average on healthcare for substandard results, so clearly reforms in the enormously inefficient government healthcare programs like Medicare and Medicaid could free up funds for the military. However, inefficiency in other federal programs is not an argument for a blank check to the Pentagon. The main benefit of defense spending cuts would not be transferring these funds to other federal departments but removing them from the budget altogether. Recently both voters and politicians have become more cognizant of the fundamental unsustainability of the federal budget deficit. 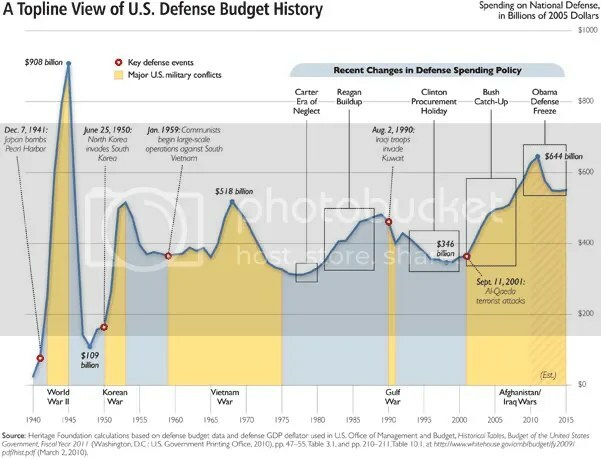 While America’s budget woes cannot be remedied solely through military spending cuts (the projected constant rise in public medical costs are a much greater threat to America’s long-term fiscal health than the Defense Department’s budget), any credible plan to reduce US spending must include the Pentagon, which consumes a greater share of the federal budget than all non-defense discretionary spending combined. Commentators who claim to be fiscally conservative while categorically rejecting a reduction in military spending do not understand this fundamental truth. Similarly, arguments that defense cuts would threaten America’s technological innovation are unconvincing. It is true that Pentagon spending sparks enormous technological advancements – many of the hallmarks of the modern era like the internet, microchip and communications satellites all sprang from military-funded research, and military needs and acquisitions drive much of the cutting-edge technological research that the US leads the world in. However, this is misleading argument for preserving the high Department of Defense budget. If anything, this reasoning harkens back to the older arguments used to justify the Apollo-era space exploration spending; while enormously expensive, the Apollo program was justified by the technological advances it produced. While it is true the space program produced many innovations, going to the moon wasn’t a particularly efficient way to fund these technological advancements. If new technologies were an important goal of the space program it is obviously much more efficient to just increase government research funding. The same logic applies to defense spending. If we value the products of military R&D then it’s much more efficient and cheaper to just fund interesting research, rather than rely on weapons programs for technologies that will have civilian applications. Justifying military spending by pointing to its side benefits is technically correct but ultimately a poor argument. The American experiences in Somalia, Iraq and Afghanistan demonstrate that despite the US’s vast military spending and unmatched capabilities America does not have the ability to decisively win the unconventional conflicts that characterize the modern era. However, this is not a convincing argument for a larger defense budget. The most expensive weapons in the military’s budget are those that have the least relevance to the type of low intensity wars the US has been fighting for the last two decades: the F-22, advanced communications nets, an airborne laser missile defense system… all of these weapons systems are built for a large conventional war with a powerful state opponent. Counter-insurgency is enormously expensive, but the tools to fight it are less so. While cutting the Pentagon budget would reduce America’s effectiveness in a future war with China a large future conflict with a near-peer rival remains unlikely, and the wisdom of spending vast amounts of limited fiscal resources preparing for a conflict lower defense spending appears perfectly capable of deterring is debatable. Of course in a perfect world America would build an overwhelming dominance against any potential adversary, not matter how improbable. But can the Unites States continue to spend trillions of dollars out of a finite and shrinking budget to prepare for a major war that is very likely to never come? However, reducing the US defense budget would preserve the US’s ability to fight the low-intensity conflicts that dominates modern headlines. It’s often argued that this isn’t an important consideration: after the trauma of the long wars in Iraq and Afghanistan the United States is unlikely to involve itself in another low-intensity counterinsurgency. However, history doesn’t support this theory. The failed US intervention in Somalia was an enormously traumatic experience for the American public, but that did not stop the United States from entering two more open ended conflicts less than a decade later. Commentator Andrew Exum recently summed up this unfortunate tendency with characteristic directness: even if Congress guts the defense budget it’s unlikely to stop future Presidents from sending the military into foolish conflicts. Additionally, in the last few decades the world has entered an era where technological advances lead to less, not greater, returns on military investment. In the 1950′s the only way to deny a powerful enemy control of the air or sea was to challenge it on equal terms: limiting an enemy air forces’ operational capability required a billions of dollars investment in a comparable air force. The same applied to sea and, to an extent, land power. However, technological advancements have reduced the investment needed to impede an enemy’s dominance. In Vietnam the North Vietnamese could not hope to challenge the might of the American air force but were able to use much cheaper surface to air missiles to prevent the American from fully exploiting their advantage. Similarly, poorer nations unable to fund a navy can use affordable technologies like anti-ship missiles to destroy a richer nation’s billions of dollars of naval investment. In the modern world while weak nations still cannot replace the dominance of powerful ones advancing technologies allow them to deny the powerful from making use of their theater control. While massive defense spending is still a prerequisite to military power it is becoming less relevant to the ability to exert control and achieve victory. Increasing the military budget is not the path to winning future wars, nor should we fear careful cuts in the Pentagon’s massive budget.